Yup, I've got a gal like that now. She saw my split LS-BG before I did, her Daddy has Forte's and MWM/402's in the living room, she has RB75's in the bedroom. Keeper! I am defenitely enjoying my Heresys very much! I am glad more and more people are discovering how awesome Klipsch speakers really are. Just the other day, I was walking out of a local theater and I swear they were using what looked like Klipsch Heresys on the walls. I have to email them at some point and see if that is correct or not (could read the klipsch badge, had same front grill, was approximate size and shape). That has made me want to make my home theater with Klipsch Heritage speakers even more. Klipschorns for the front R & L, Belle Klipsch (or La Scala II) for a center front, and Heresys for the surround work well for me. I use a RSW 15 sub for movies, but have the Khorns running full range, and don't bring the sub in until 40Hz, because the Khorns are more precise above that. The whole system is very dynamic. I'll bet a lower budget version with Cornwalls R & L and Heresys everywhere else would be plenty good. Movies with soundtracks made after the dawn of the magnetic/stereo era (c1954) sound great over a system like this. Older optical soundtracks will not sound so good. Agreed, there are also several wife upgrades to this, Cornwalls, La Scala, Belles....need i say more. Heritage is an addiction. I also was drawn to Heresy I bought a pair at a garage sale 1972 or 73 wile in high school. Around 75-76 I bought a pair of LaScala's new that I still have today and last month I bough a pair of K-Horns. Currently looking for a pair of Heresy's. I guess you could say I like them. If you have any cash left over try and find a tube amp. After 36+ years of SS I found a TAD-60 on Craig's list for 500 I could not believe the difference there is no going back. Congrats_ those look nice. The slant bases work well for risers and would be pretty easy to build (not as easy as using Duplo blocks) Anyway what is a college grad doing with Duplo blocks? I have liked the sound of my HarmonK AVR 7000 and you can find them pretty cheap. I'm up by the chain of lakes if you ever want to see the tubes glow. Oddly enough, I have recently been considering trying out tube amps. Hoping to land my first fulltime job soon and will need places to spend the income! These are still the best things I have ever purchased! If your interested I just picked up a TAD-150 pre amp. I most likely will sell this summer /fall. Reason being I just found out a friend found a Mac. C2300 for me. Wile I'm TOTALLY happy with the TAD gear I could not pass up the Mac. If you have a little time Google TAD-150 and TAD-60 there are many reviews out there. A LOT of bang for the buck. I have 675 in the pre and 500 in the 60. Make new friends and let them know you are interested in stereos. 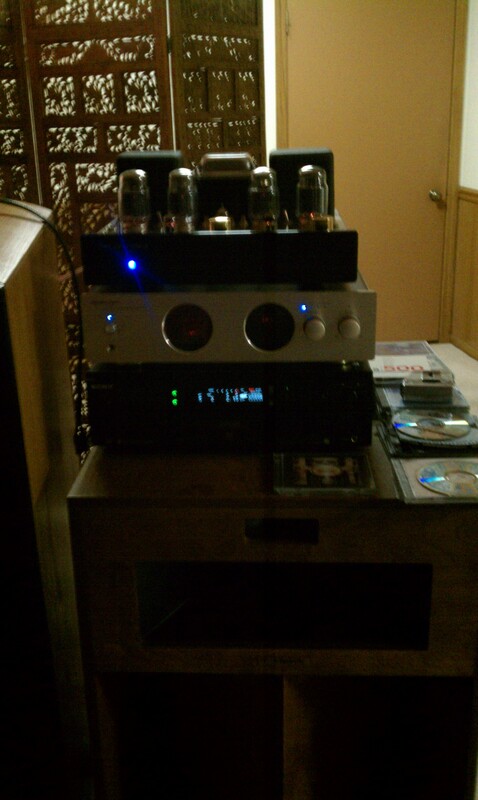 I got a set of Tube amps (mono) and a Tube pre amp from Neighbor. Best sound that I ever heard in that room of the house. Khorns love tubes I've been told. Good luck on updating your system and using it to screen for future wife. What speakerfritz says is very good advice. I listened and am glad I did. A lot of the time these guys are talking way over my head, but give good advice to those that are respectful. Love this forum. Welcome aboard, 20 years from now you will still be saying WOW every time you turn them on. Bob Crites sells slant risers, unfinished at a very reasonable price. Start calling around to local veneer shops, they may be willing to peal the veneer off and re-veneer for not too much. $100? The classics are Walnut and Cherry IMHO. Hey man, very very nic! decided to take the plunge too. what a great place to start!.I have been using the Hersey line for years as my mainstay hard rock listening speakers and lov'em! I have over the years made som emixed combinations of drivers, but I think you'll be surly pleased with those, hardly can go wrong!/..Stick around here, some great folks who offer smart advice freely, exchange parts and pieces fairly and have all been really good to me since i have joined, I sat back and just watched these forums for years and finally joined up., so happy I di, and I'm sure you'll find the place interesting, friendly and a nice place to sepnd some internet time at, I have. Let us know how you feel about those nice speakers after listening to them a bit..and once again, welcome to here!!! I have to say, Klipsch Heritage and Tube amplification is a match made in heaven!